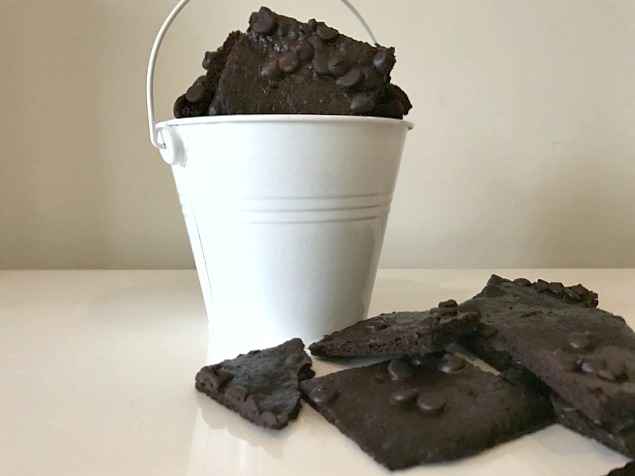 Love this thin brownie brittle that’s a combination of a brownie and a cookie. So delish, enjoy! 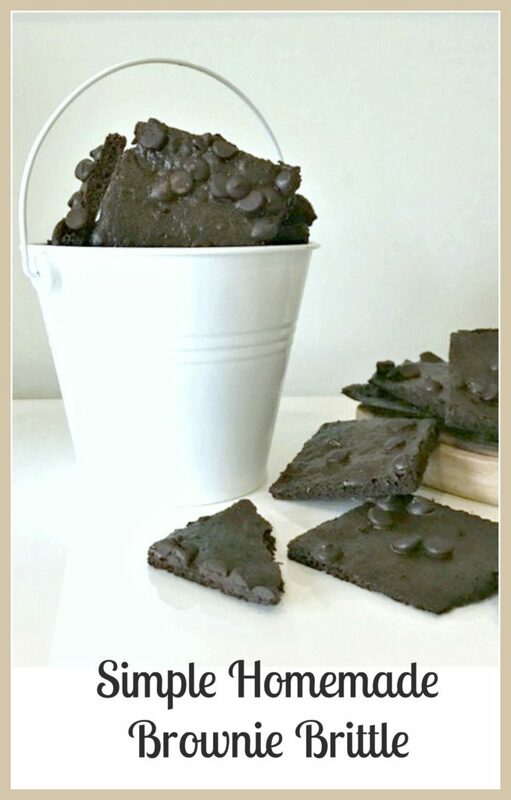 You know that delicious brownie brittle you find in stores like Costco and Target? It’s in those pouches. My family and I love it. I finally came up with my own homemade version that tastes very similar. So similar that my family didn’t know when I served it one night while we were watching a movie. The best part is, making this at home was much less expensive than buying it in the stores. This recipe is easy to follow and prepare . It’s kind of between a brownie and a cookie. Try and taste and see what you think. 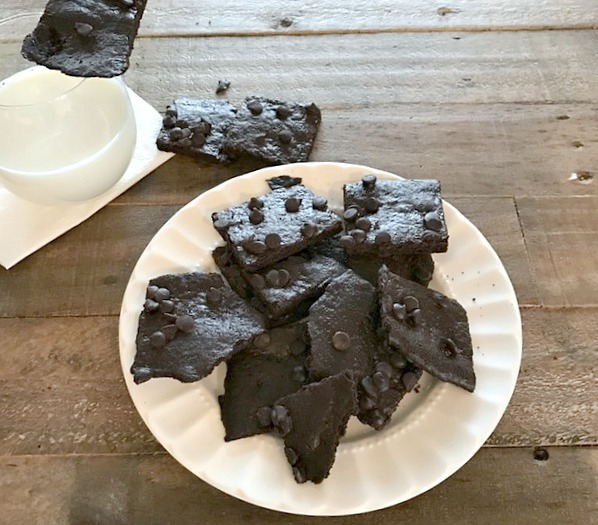 Preheat oven to 325 degrees, line a heavy cookie sheet with a Silpat, (highly recommended for cookies too) or parchment paper, spray lightly with cooking spray. Set aside. In a large mixing bowl, whisk egg white until frothy/foamy. Gradually add in sugar until combined. Slowly add in oil and vanilla extract. Using a rubber spatula, mix in flour, salt, baking powder, baking soda and powdered milk. Stir until all is incorporated. Dig down to the bottom to get all the dry ingredients mixed in. Batter will be thick. Sprinkle in about 2 tablespoons of the chips and gently mix in. Scrape batter onto prepared baking sheet. Take your time while you spread out as thin as you can. Try to make as even as possible. Keep using the spatula or a large offset spatula to even and smooth out the batter. Toss remaining chips over top of batter. Bake for about 22 minutes. Take out of oven. Gently Cut into uneven pieces. I got 24 craggily shaped pieces. Put back in oven for about 10 minutes. Take out and let cool completely on wire rack. Test for crispiness. If there are some chewy pieces, separate pieces, place back in oven for 20 minutes at 200 degrees. Let cool completely again. They should be crispy and perfect! As they set up at room temperature, they will crisp up even more. Enjoy the chocolate yumminess! **Note: All highlighted ingredients and supplies are ones that I use. They are only a suggestion. Happy baking!